Thank you to all of our 2019 sponsors! 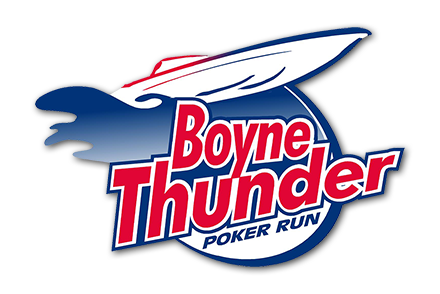 The 16th Annual Boyne Thunder Poker Run on Lake Charlevoix & Lake Michigan. Hear the Thunder! Port stops of Boyne City, Charlevoix, Northport, Elk Rapids, Harbor Springs, Bay Harbor, and Horton Bay. Leaving Boyne City, boats will head down Lake Charlevoix to beautiful Charlevoix. Once out on Lake Michigan, the course will go south for card stops at Northport and Elk Rapids, then return to the City of Charlevoix Marina for lunch in beautiful downtown Charlevoix. The Poker Run continues after lunch with cards stops in Harbor Springs and Bay Harbor in Little Traverse Bay, then returns to Lake Charlevoix for the final card stop at Horton Bay. Follow Boyne Thunder on Facebook, Instagram, and Twitter! There’s nothing like it … Boyne Thunder is unique! There is no other event like it in Northern Michigan. Since 2004, we have grown into a world class event with boaters from all over the country, great media coverage, national attention and great local support. When you come to Boyne City we make you feel special because you are. Hear from the boaters. What do you like best about Boyne Thunder? Boyne City knows how to put on a great, fun and adventure-filled poker run! We were very impressed with how involved the local community was and how welcoming they are. It’s as beautiful as Key West in its own way. I do them both every year. The locals in Boyne are over the top gracious and helpful and appreciate all of us coming to town. That is felt by everyone I have talked to and its genuine I’m sure. *No promo codes will be used this year! Note: Proof of insurance for boats is required with your entry in a .pdf format and must be emailed to boynethunder@gmail.com by June 1, 2018. Cancellation before June 22, 2018, will result in a forfeiture of $300 deposit. Cancellations on or after June 22, 2018 will result in forfeiture of all registration fees. There will be no partial rebates for unused dockage or non-participation in any Boyne Thunder events. Boyne City Municipal Marina will be the base of operations for the event. Shower and bathroom facilities are available. You are welcome to spend the nights aboard your boat, but you may wish to stay at one of the many area lodging facilities. Please make hotel reservations early!